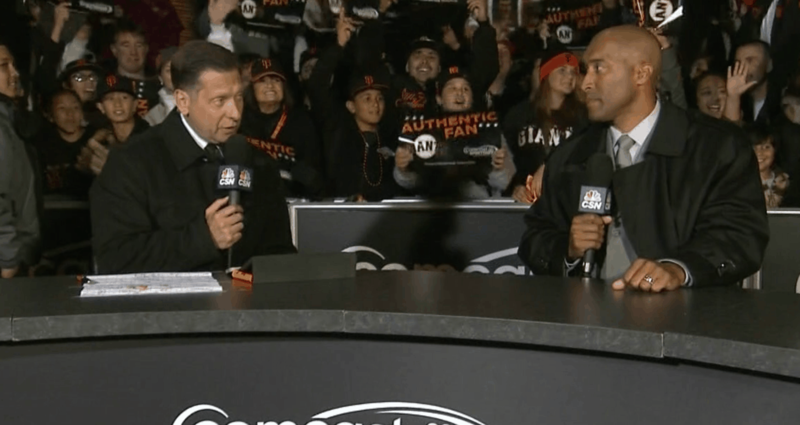 Why does Comcast SportsNet Bay Area hate its best viewers? I love the San Francisco Giants. I just love baseball in general, but I’m a big Giants fan. I’m the kind of fan who watches some/most/all of the TV coverage for pretty much all 162 games. I’m the kind of fan who watches the pre-game and post-game coverage. It’s great pre/post coverage especially when the A-Team of Greg Poppa, Bill Laskey and Vida Blue is assembled. That trio has great chemistry. I love Willie Mays as much as the next 50+ year old, but I loathe CSN Bay Area’s “Say Hey Tuesdays” when they do the pre/post game coverage for Giants Tuesday night home games from a live shoot at 24 Willie Mays Plaza and encourage people to yell and scream behind the telecast. Yep, they even give fans signs to hold up (see picture above). Read moreWhy does Comcast SportsNet Bay Area hate its best viewers?